Save more when you purchase five or ten copies of Sola Scriptura. Sola Scriptura, the formal principle of the Protestant Reformation, is essential to genuine Christianity, for it declares that the Bible is the inspired word of God, the church’s only rule of faith and practice. Yet this doctrine is under assault today as never before, both from outside and and inside the church. In this book, several leading Reformed pastors and scholars, including Joel Beeke, Sinclair Ferguson, Robert Godfrey, Ray Lanning, John MacArthur, R.C. 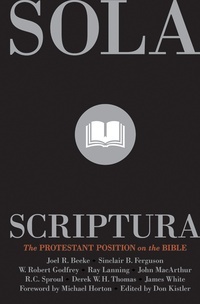 Sproul, Derek W. H. Thomas, and James White, unpack the meaning of the doctrine of sola Scriptura (“Scripture alone”). They also explain where the attacks on the Bible are coming from and show how those who accept the Bible as God’s inspired Word should respond. Sola Scriptura: The Protestant Position on the Bible is a treasure trove of information and a comfort to those who grieve to see the twenty-first-century church wandering away from the safe harbor of the Bible.